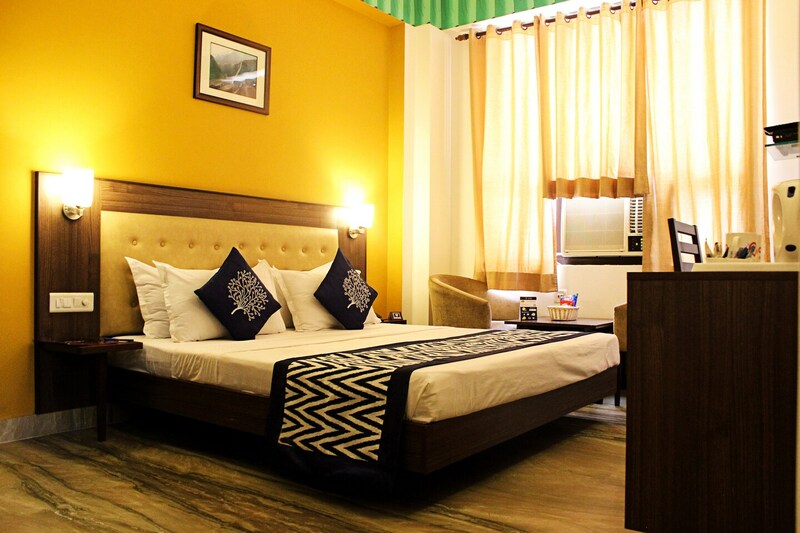 The Hotel Inn Tawang is a bright and tasteful property, located just a few paces from the Karol Bagh Metro station in New Delhi. The place is within easy reach of the Telephone Exchange Bus Stop. Nearby places of interest are Gurdwara Sahib Moti Pahari, Rajendra Park and Bhuli Bhatiyari ki Mahal. The hotel boasts of in-house restaurant, a conference room and an elevator. The rooms are bright, with large windows, and feature trendy furniture and beautiful bed linen. Each room comes with a TV, AC, mini fridge, room heater, free Wi-Fi and seating area. The bathrooms have geysers. The hotel also provides power backup, CCTV security and laundry services. Eateries like Punjabi Chaap Corner, Udupi Eating House, 27 China Street and Thanco's Natural Ice Cream are nearby.